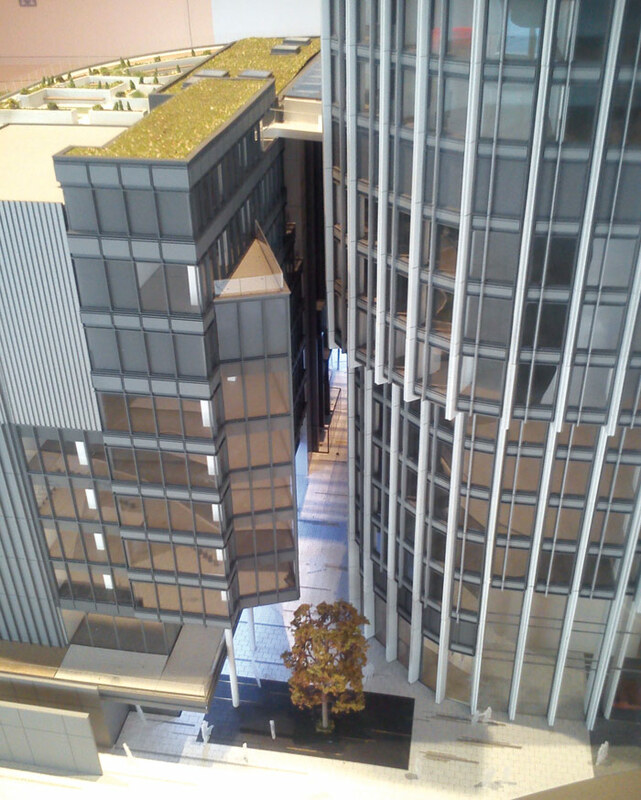 Richard Seifert’s second- and third-tallest office towers are simultaneously being transformed into flats. 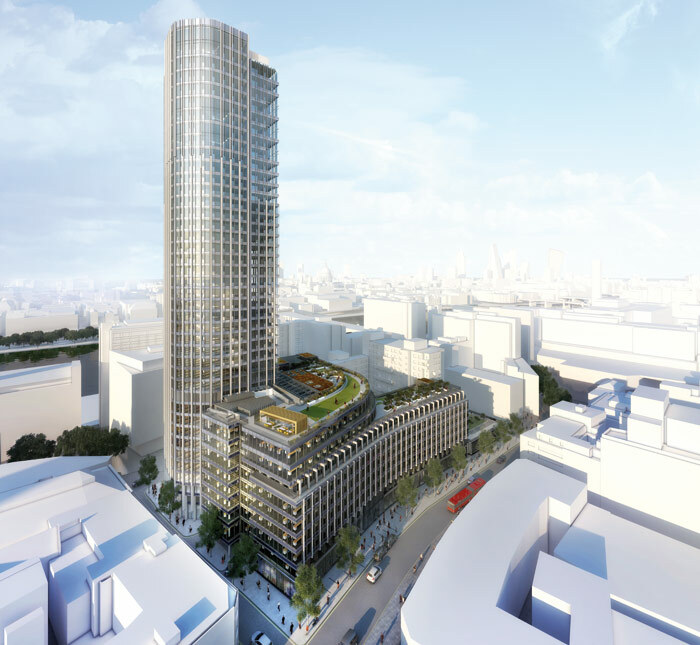 The teams working on Centre Point and the South Bank Tower could not be more different, but both find the key to delivering 21st-century landmark projects in the original Seifert designs themselves. 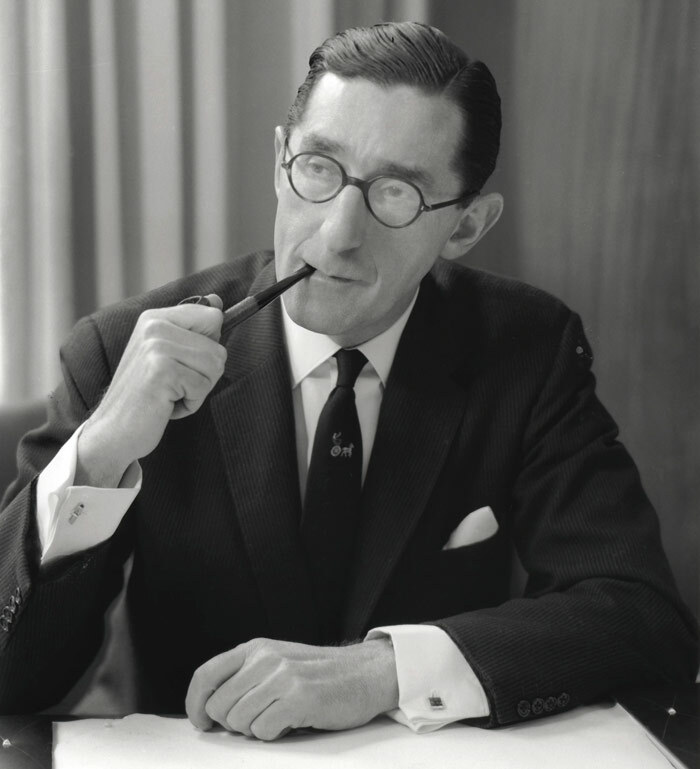 Colonel Richard Seifert, the most successful British commercial architect of the 20th century, was credited with changing London's skyline more than any other architect since Christopher Wren. His office towers were widely hated, but gradually they have won over critics and public alike, even eliciting love. Some of the best have been lost, but now two are being reborn as upmarket residential towers within transformative, mixed-use developments that reconfigure their sites. Each deliberately exploits rather than obliterates the Seifert legacy. Developer Almacantar has assembled a cross-disciplinary team for Centre Point, with RIBA Award-winning Rick Mather Architects, Conran and Partners, and pattern-making fashion legend Eley Kishimoto. The tower itself will look almost as it did when built. Name-checking the great Brazilian sculptural modernist, then the pioneering Italian who engineered Milan's similar-sized Pirelli Tower, Rick Mather Architects' partner Gavin Miller says of Centre Point that 'we don't see it as a brutalist building. It's far more exotic, more like a Niemeyer or Nervi'. Less than 2km away, King's Reach Tower is being extended and renewed for developer CIT into the South Bank Tower by architecture practice KPF, the global high-rise design titan responsible for the tallest towers in Hong Kong, Seoul and Shenzhen, as well as the almost-built Pinnacle, which would have been second only to The Shard in London. Chris Richmond, associate director at CIT says that the South Bank Tower 'does not "erase" the memory of the Seventies' building, but has added a new layer of renewal and adaptation... a modern and innovative representation of Seifert's original design intent'. John Bushell, KPF principal, says the South Bank Tower is 'a generational rebuild... we're not tinkering'. But first, what's the story behind these towers? Bartletttrained Richard Seifert's first major London project, Woolworth House (1955) with its Royal Festival Hall-like facade, was considered old hat, but his buildings soon became cutting edge. Initially he was at least as interested in building technology as in style. When Seifert designed one of five office towers in a City of London tightly masterplanned London Wall, it looked exactly the same as the others, but was the cheapest to build because of its pre-cast concrete H-frames behind the glass curtain walls. Rapidly rising speculator Harry Hyams developed that building, and he commissioned several more to follow. Centre Point is the best known. Hyams had made an unwritten deal with the London County Council, which wanted a traffic roundabout at St Giles Circus, but Compulsory Purchase Notices served to acquire the site were stuck in legal proceedings. Unlike the LCC, Hyams could buy-out properties at market rates, and in return for delivering the site for the road scheme, he was allowed to build offices there with twice the designated maximum plot ratio. The whole scheme had to be in place before a new Town & Country Planning Act made it illegal to grant planning approval on unsecured sites. Seifert submitted architectural plans just days before it became law in August 1959. It took Hyams until 1962 to gain the whole site, by which time the roundabout plan had been dropped. At 117m high, Centre Point was London's tallest office tower when completed in 1965, but would remain empty for 15 years. Hyams thus avoided paying rates and let the capital value bloom, because it was based on potential rents which were rising fast. That made him a bête noire to the public. Centre Point was famously squatted in 1974. The original Centre Point design, although influenced by the Pirelli Tower, was far plainer than what was built, but more imaginative 'expressionist' high-rise forms were emerging from Seifert's practice. His practice partner George Marsh is often credited with designing the remarkably slender 34-storey sliver of Centre Point, which was described as London's first Pop Art building. But crucially, it was Seifert who in 1961 sketched the pre-cast concrete T sections that create Centre Point's unique grid facade, and also carry its load, instead of a central core like every other skyscraper of the time. The hypnotic facades they create are an extraordinary, enduring alternative to the flat curtain walls of the time. There are also other strange exterior concrete features, such as the first-floor, cantilevered, ribbed cage above the exterior stairs that were beside inaccessible fountains by Jupp Dernbach-Mayen on the Charing Cross Road, and the zig-zag corrugated cornice. On the site's eastern side is Centre Point House, a six-storey rectangular housing slab mounted on a three-storey podium with a facade grid of staggered concrete squares. Completing the ensemble and connecting the tower and housing along New Oxford Street is a breath-taking, 80m-long, triple-height, glass-sided, structurally independent 'bridge'. 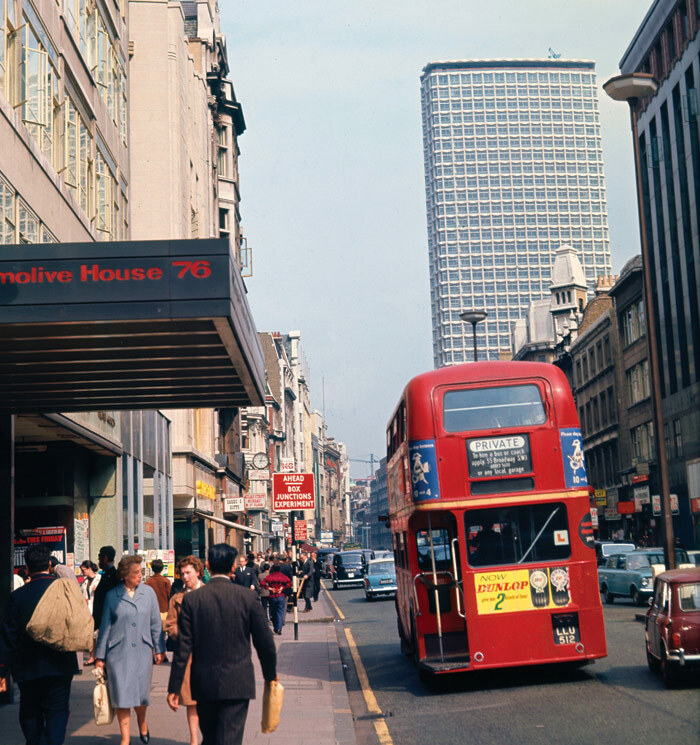 It is held aloft with enough clearance for London buses by some of Seifert's trademark tapering 'dinosaur leg' piloti, which also stand beneath the tower and are mosaic-clad. Centre Point was Grade II listed in 1995. By the Seventies, Seifert had parted ways with Hyams, and expanded his client base and practice, but was beginning to suffer a backlash from the Royal Fine Arts Commission, the forerunner to CABE. It increasingly opposed planning consent to his schemes, or demanded cuts in heights. It did this with the original Seifert scheme for the South Bank, which envisioned a surprisingly glassy tower behind a long Barbicanesque riverside block with barrel-roof skyline elements. The latter was replaced by Sea Containers House, designed by American William Platner, while Seifert's tower was redesigned in 1972. An island T-shaped podium building connected with it via a first-floor walkway, which opened into a shadowy brick-paved garden to the east, below a residential block, Rennie Court. The lead architect was Seifert partner Reginald Jenkins. The 30-storey, 111m-high King's Reach Tower was finished in 1978 and publishing firm IPC moved in. That made it the nerve centre of Tharg from planet Quaxxann, who allegedly edited IPC's 2000AD comic there. The northern end of the South Bank Tower atrium. Seifert's original fins and step-back at the base are retained. Photo Credit: Model For CIT Photo Herbert Wright. 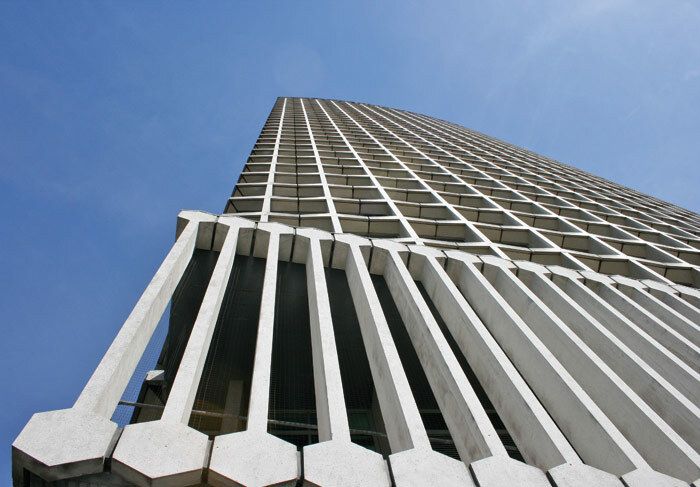 This was another Seifert tower unlike any other at the time, with its exterior vertical fins drawing in demurely to become columns at the base, a subdued colour scheme of smoked glass and brown spandrels, two opposite corners rounded off in a square plan, and a stepped-roof profile with the core rising highest. It anticipates Seifert's 183m-high Tower 42, completed in 1980, also co-designed by Jenkins. 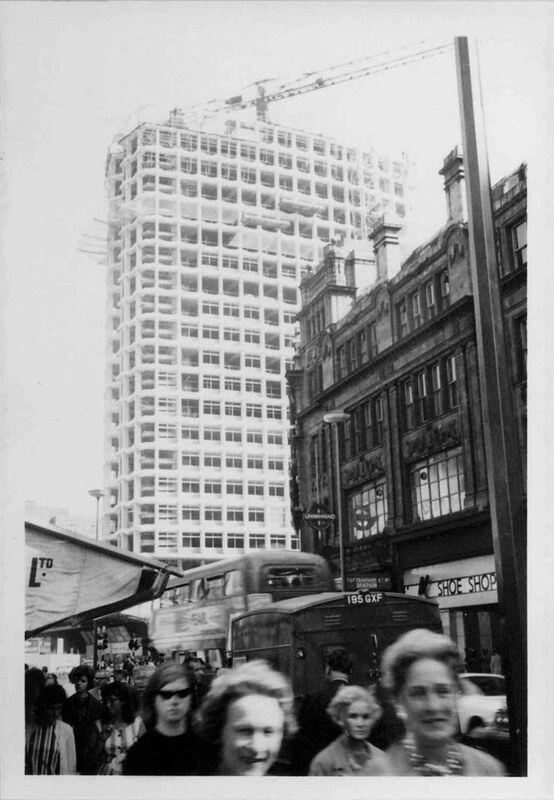 Seifert questioned high-rise living (though he designed it for Glasgow and Brighton), but much has changed since his time. At Centre Point and King's Reach Tower, floorplates are too narrow for today's corporate tenants, and their ceiling heights are tight at under 3m. Both towers emptied. In 2013, English planning laws restraining change of use from office to residential use were relaxed, but the market was ahead of the changes. 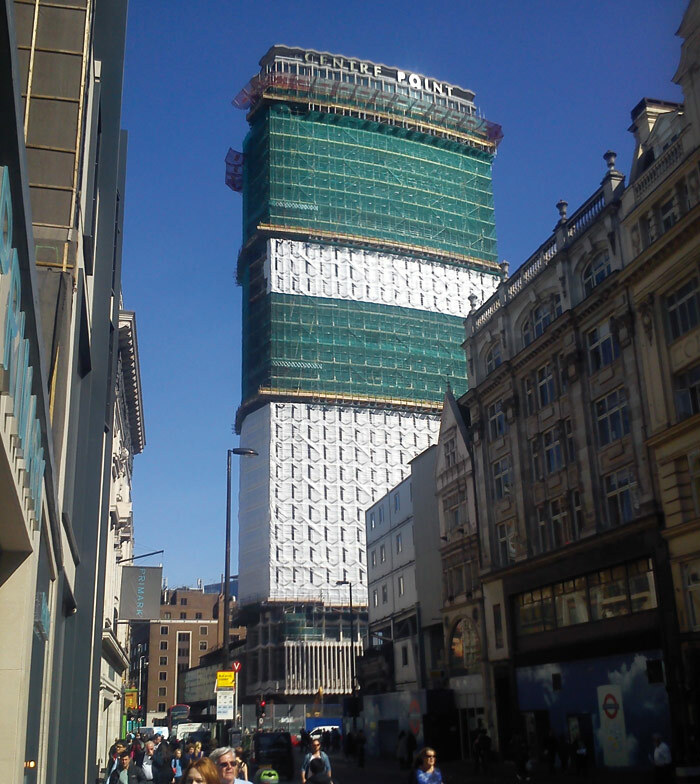 CIT bought King's Reach Tower for £60m in 2010 and Almacantar bought Centre Point for £120m a year later. Both announced their interest in residential conversion. 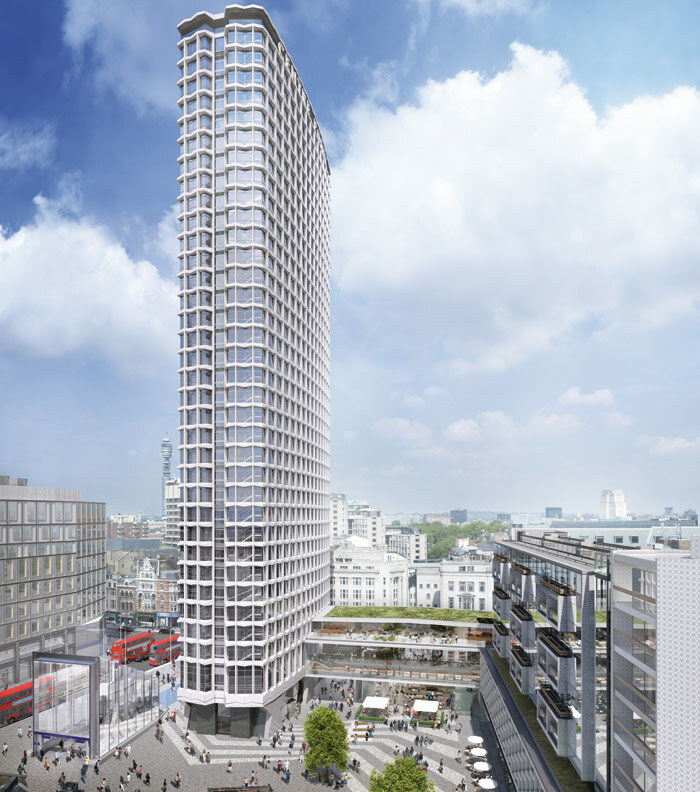 Centre Point itself will become 84 flats, between one and four per floor. Contractor Brookfield Multiplex moved in this January, and as it clears each floor, it's been laser-scanning it so the architects can do a virtual test-fit to a millimetre tolerance (five to 10 times finer than when it was built). Spandrels are being replaced with glass. The first floor will have a swimming pool, and the exterior stairs will be brought inside to access a floating walkway between dinosaur legs in the tower, which will be revealed when a mezzanine landing is cut away. Terrazzo flooring and marble inlays are being retained. Some interior black granite is being replaced with wood panelling, but will be reused outside. Nowadays, as Almacantar's development director Kathrin Hersel notes: 'The world is not about traffic, it's about public realm'. Centre Point was grounded in a traffic scheme, its intended roundabout actually running around the tower and under the bridge. That public realm (covering car park and plant) extends south from the Centre Point ensemble to create a new plaza that Miller describes as 'of an order with Trafalgar Square or Leicester Square'. Crowds will surge, especially when Crossrail opens at the end of 2018. Between the tower and Charing Cross Road two new glass entrances ('the Cheeses' by Stanton Williams) to Tottenham Court Road Tube station are already emerging. Not surprisingly, a key element is retail... 4,200 sq m of it. The space below the bridge will be partially enclosed to create two new restaurant units, its vast first floor will acquire an axial mezzanine level to offer a total of 1,270 sq m (it's 'all about display and visibility' says Hersel), and the second floor will open on to outdoor terraces either side. Rick Mather's work on the South Bank Masterplan came in handy - Miller talks of 'the idea of taking buildings that didn't touch the ground'. Retail continues under Centre Point House, the more boutiquey ground floor permeated with passages from the plaza towards Renzo Piano's Central St Giles to the east. Between first and second floors in the podium box below the housing, a ceiling slab is coming out to make another long double-height space between the concrete staggered-squares facades, which will become fully glazed brise soleils. There is also new build: 13 units of affordable housing will be stacked above where the rockers' pub The Intrepid Fox was. They are framed by a ladder of cantilevered concrete facing St Giles Church, informed by the balcony bays in the existing housing facade - and an Eley Kishimoto pattern. Another of its patterns marches across a wrap covering the entire tower to hide construction work. Disorientated West End visitors will miss the 3m-high crown lettering proclaiming CENTRE POINT that lights up at night, but only until works finish in 2017. 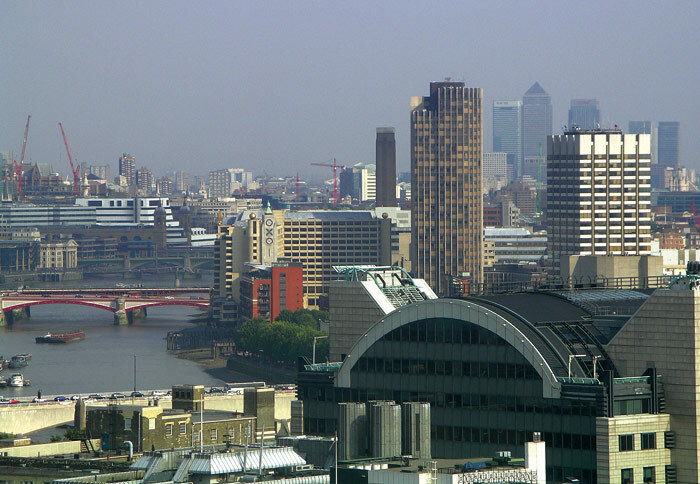 In fact, London's actual geographical centre point is south of the river. A few minutes walk away from it, Seifert's nexttallest tower has now overtaken Centre Point in height. 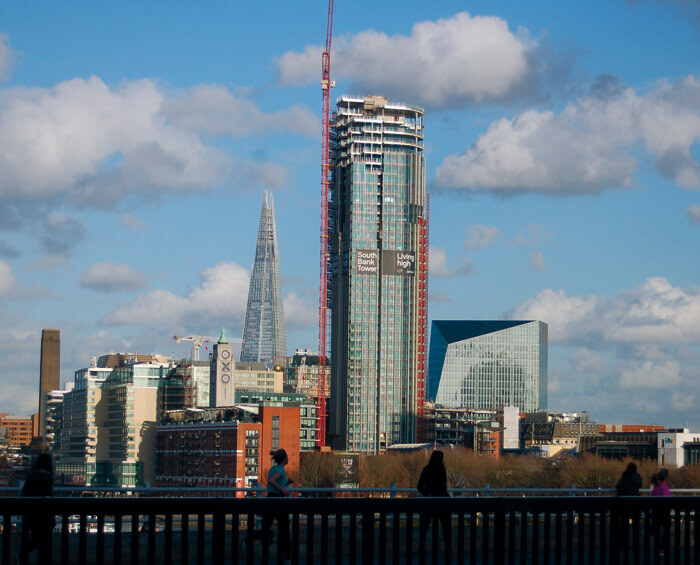 Topped out by contractor Mace last September, 11 new floors now make the South Bank Tower 151m high - about what Seifert wanted in the first place. As at Centre Point, it's not just about the tower. 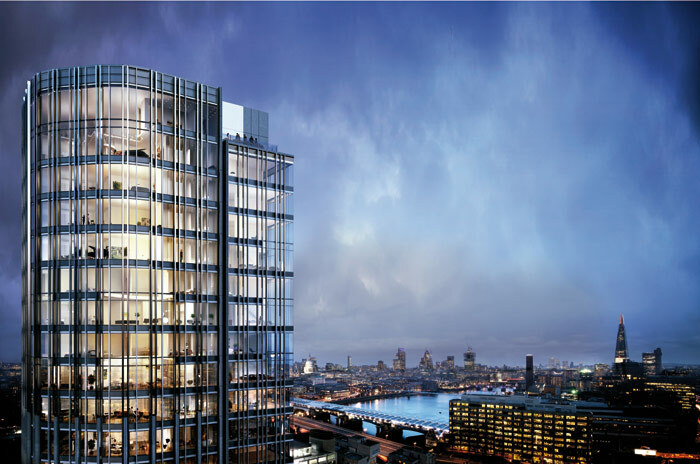 The South Bank Tower project is a mixed-use development covering the whole block, designed to extend the South Bank success story a block inland, and reconfigure public access to it. The east-west section of Seifert's six-storey podium building curves gently with Stamford Street, and a wing extends north. Unlike the tower's, the floorplates are big - 'we thought, what fantastic space', says Bushell. So, above the ground floor the office function is renewed, but with an arc of three extra floors curving around the tower, stepped back in the south to mark Seifert's original massing. A big surprise is the nine-storey-high, 600 sq m atrium in the gap, offering a north-south passage through the site, and an entrance in the west. Its north opening is like a nine-storey crevasse that opens into a glass-topped space, with panoramic lifts accessing offices. Although it's private land, this is an 'unrestricted' public way. For Southwark Council, the 'entire thing was giving access from the hinterland to the river', says Bushell. The ground floor will also feature a swimming pool and 3,400 sq m of retail. The new arc of 10th-floor roof is a key offering for the 191 apartments in the 30 floors of tower above it. This will be the residents' sky garden and be accessed by a bridge. KPF architect Anabel Fernandez talks about where the practice's wavy landscape design came from: 'We looked at a map of Roman London and realised that the river came up [to here].' A zinc-clad pavilion will sit on the south-west corner. Further, the first-floor garden under Rennie Court will be re-landscaped. Brown spandrels are replaced by dark-grey powdered aluminium, but the pre-cast concrete fins on both podium and tower facades remain key to the look. They're getting cleaned, and some facing the atrium need additional steel plating to take three new podium floors-worth of loading. But there are new fins, mainly of anodised aluminium. 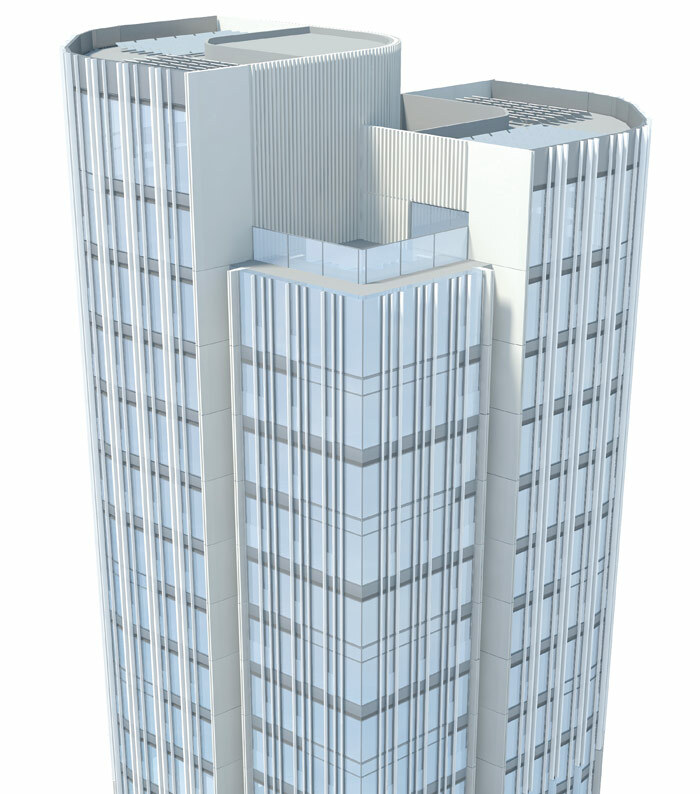 The original square tower plan with alternate corners rounded off is now extruded upwards, but the memory of the Seifert design has been subtlely yet clearly marked where pairs of new fins start above each old fin. Fernandez describes it as an 'interlocking language between old and new'. Structurally, the Seifert tower is all about heavy pre-cast concrete. Above it, the KPF tower is light steel. Floors 40 and 41 contain two duplex penthouses and, above that, roof photovoltaics and a central 42nd floor for plant. The roofline staggers in sections, just as Seifert's did. Unlike Make's abandoned 2005 plans, which would have made it shiny blue and flat-topped, KPF's South Bank Tower looks Seifertesque. KPF has good atrium form in London, especially the 2008 works on the 1932 Unilever House across the river. As for extending the tower, Bushell compares it with its Tour First extension at La Défense. 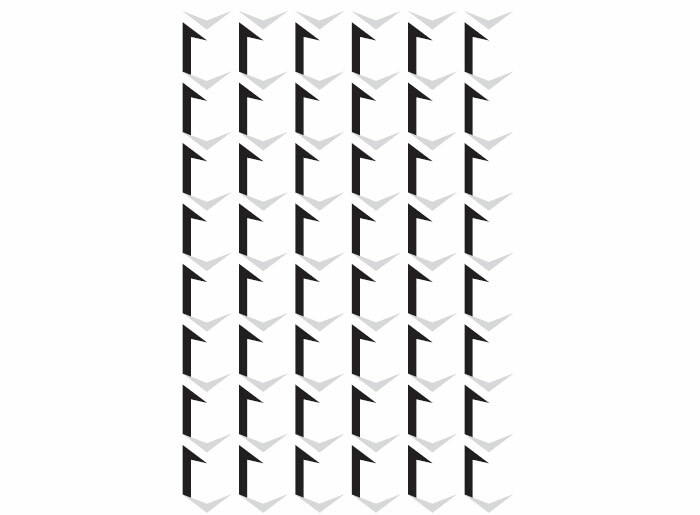 A 1974 block reached 159m, but since 2011 folds upwards around a 231m-high spire. (Although not curving, it looks rather like London's Pinnacle would have). With the South Bank Tower, KPF has also bounced back in style after highprofile partner Lee Polisano walked away from its London office. Seifert always strove to save construction time. Bushell says that rebuilding Seifert saved a year compared to demolition and new build. That should give a strong message to developers eyeing other vulnerable towers remaining from the Sixties and Seventies. John Madin's 80m-high Colmore Row tower (1975) in Birmingham may be brutalism at its blockiest, but just as opinion is warming to its style, it is set to be replaced by cold, stepped, glass slabs by Doone Silver. And rebuilds need not obliterate the past, such as Chipperfield's imminent reworking of Howard Fairbairn's solid, brutalist Portland House does in the Victoria district of London (1963) - curiously it's set to imitate a lost Seifert masterpiece, Drapers' Gardens. Just a stone's throw from Brixton Prison is a global epicentre of designer cool. Step into the shabby-chic interior of an old, white, industrial building, and you are in a slightly trippy, bohemian dimension that feels like another era. This is the artisan studio base of Eley Kishimoto, pattern-making magician. Since 1992, the partnership has scaled the heights of the fashion world, working with names such as Louis Vuitton and Alexander McQueen, and reached out into industries from mobile phones to motorbikes. Now Eley Kishimoto is on the Centre Point team. 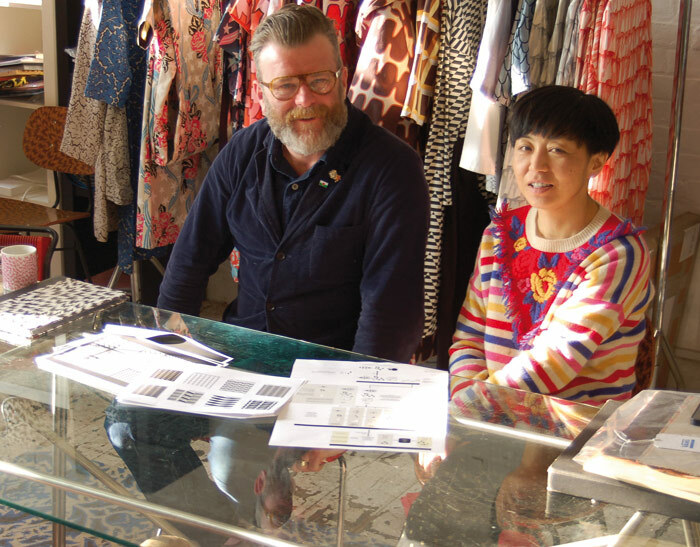 Wakako Kishimoto, looking both serious and seriously hip in a woolly jumper that somehow combines stripes and flowers without clashing, and Mark Eley, a big, warm, beardy bloke bubbling with energy, sit down to talk about it. 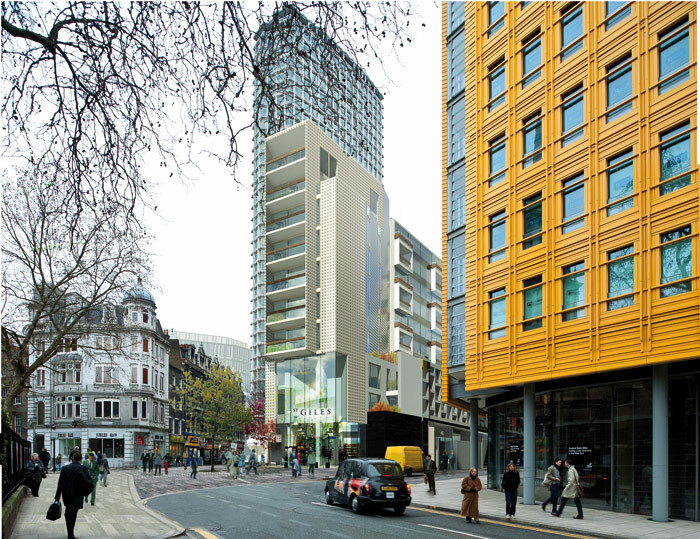 It was Hat-trick Design, engaged by developer Almacantar to brand Centre Point, that first approached the duo. The idea was to create a 'market asset' from patterns inspired by Seifert's building, extending to a fashion collection. Centre Point looms in both their pasts - as a Brighton fashion student, Eley staged a show there, while Kishimoto was at Central Saint Martins, just across the Charing Cross Road. 'When you look closely at it, it's a really crazy design,' she notes. Eley says: 'It's incredibly relevant to our natural handwriting,' because architecture has 'some kind of repetitive understanding.' They've previously worked with 6a architects and Studio Weave, and are part of Rick Mather's short-listed competition team for the East London intellectual quarter Olympicopolis. Eley wistfully wonders if 'maybe I'm just one of those sad people who try to be an architect without the qualification'. Buildings in restoration get graphically represented on the screens that cover the work, but this is something else. Is it art, asks Blueprint, like Christo and Jeanne-Claude plain-wrapping buildings including the Reichstag (1995)? Maybe. Eley 'totally adores' their work. Eley Kishimoto is driven to keep its hands-on studio work ticking, but Centre Point 'allows our spirit to open up', Eley says.